Agricultural Packaging is necessary to protect and preserve agricultural products and resources for longer periods of time. Agricultural packaging is used for product branding and reduces shipping costs. Agricultural packaging can be flexible intermediate bulk containers, fiberboards, clamshell packaging and more for seeds, grains, silage, and food and vegetables containment. Corrugated boards and plastic films are the most commonly used agricultural packaging around the globe. Agricultural packaging is necessary for cost efficient products shipments. The understandability of agricultural packaging is necessary for short term as well as long term goals of a business. By the means of agricultural packaging sustainable agriculture with food security can be achieved. Agricultural packaging ranges from handheld containers to bulk containers to accompany agricultural applications. Agricultural packaging market is anticipated to record a CAGR of 5.3% over the forecast period. The agricultural packaging market is expected to value at USD 4.17 billion at the end of the forecast period. Many multi-national companies are concentrating towards new product advances in agricultural packaging. Moreover, the many advantageous properties of agricultural packaging are exploited in the field of agro-chemical and horticulture industry widely which is expected to drive the agricultural packaging market rapidly. Currently the global agricultural packaging market is observing vibrant growth owing to increasing demand of seed storage containers in the market. Advance in agricultural industry in the past few years and growing farming process innovation is projected to drive agricultural packaging market besides the wide range of functions of agricultural packaging in an immense range of processes such as shipment, storage, handling, assembling and more during the forecast period i.e. 2018-2027. On the basis of regional platform, global Agricultural Packaging market is segmented into five major regions including North America, Europe, Asia Pacific, Latin America and Middle East & Africa region. As a well-developed agriculturally advanced flourishing market, North America is panned to observe substantial agricultural packaging market growth due to rising agricultural packaging usage for storing liquid pesticides, solid grains and seeds. North America is expected to be followed by Europe in terms of consumption due to expanding agricultural packaging requirements in agro chemical and food export industries. The rising demand for agricultural packaging for various shipment and storage processes in agrochemical industry, horticulture and nurseries are expected to drive the market rapidly over the forecast period. Growing urbanization with rise in disposable income is increasing the trend of kitchen gardens. On account of increasing trend of use of crates and pallets in kitchen gardens and nurseries for planting flowers and herbs is expected to drive the agricultural packaging market sturdily during the forecast period. Applications of agricultural packaging in the growing import and export industry across the globe for fruits, vegetables, grains, seeds and more are anticipated to contribute significantly in the crates and pallets market. Moreover, depletion of agricultural produces has resulted in increased awareness regarding safe and secure agricultural packaging for harvest shipment to the local markets which is anticipated to contribute significantly to the agricultural packaging market over the forecast period. Growing urban population and rising pressure on the food produced is estimated to create an increased demand for agricultural packaging solutions that are cost effective as well as efficient. With the help of agricultural packaging, the shelf life of the harvested products whether it fruits, vegetable, grains or seeds, can be increased leading to higher a demand thus, expanding the agricultural packaging market across the globe. Agricultural packages provide moisture as well as oxygen barriers resulting in better prevention from food depletion. 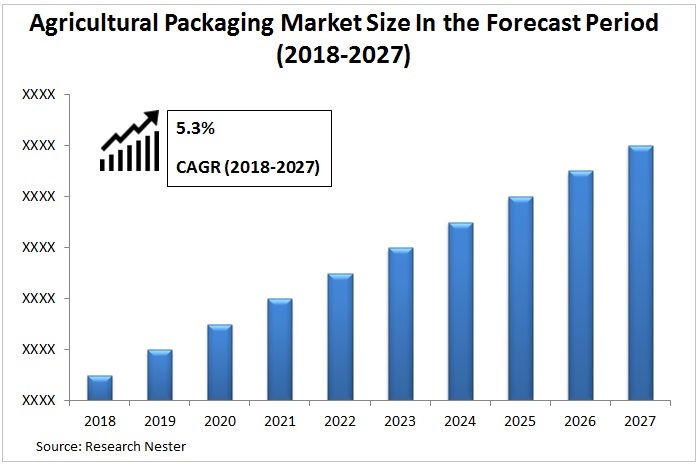 Furthermore, growing demand for packages with temperature adjustment and quality tracking properties is expected to propel the agricultural packaging market during the forecast period. However, lack of willingness to input further expenses in food transportation from the agricultural producers side in the under-developed and developing countries is predicted to slow down the agricultural packaging market growth over the forecast period.